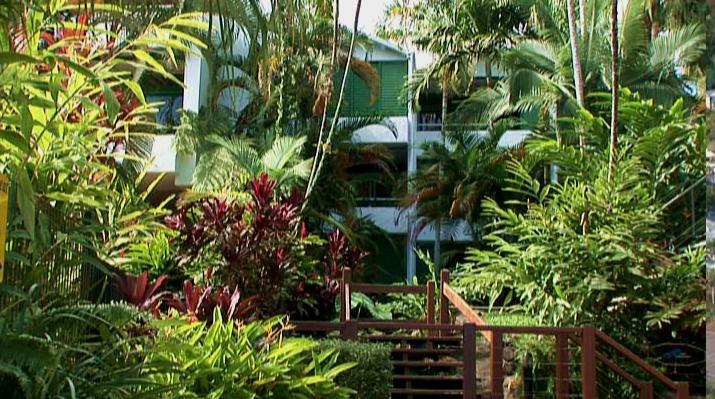 Club Tropical Resort is ideally located on Macrossan Street just minutes away from Port Douglas village and Four Mile Beach. 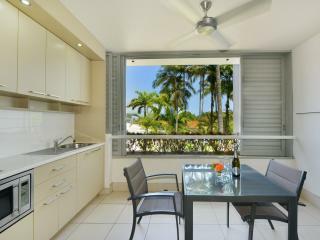 This Port Douglas accommodation offers spacious self contained 1 bedroom apartments and studios offering views of the village, lagoon pool or Dickinson Inlet. Although the resort is located on a busy street, the accommodation itself offers a quite secluded area that is surrounded by lush tropical gardens. The facilities at Club Tropical Resort include a free form swimming pool, hot spa pools and a sauna. Close by in Port Douglas there are many restaurants, cafe's, bars and shops that offer a great atmosphere. For your next Port Douglas holiday why not try Club Tropical Resort, and experience the beauty of the Great Barrier Reef and the Daintree National Park. 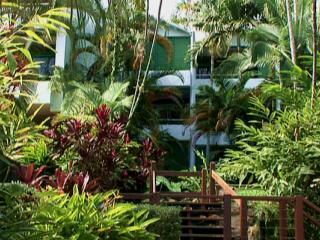 The resort offers studio and 1 bedroom apartments decorated in bright tropical colours. 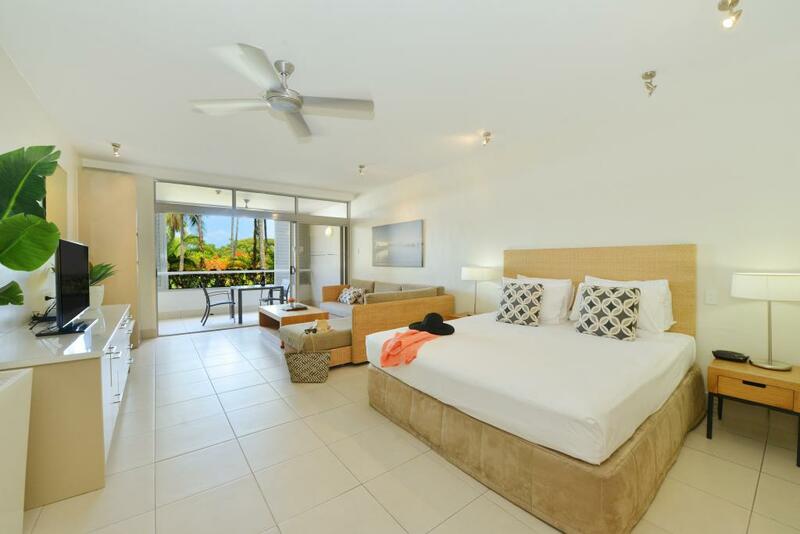 All apartments are self contained with kitchens located on a private balcony overlooking the landscaped water gardens, lagoon pool or Dickinson Inlet. 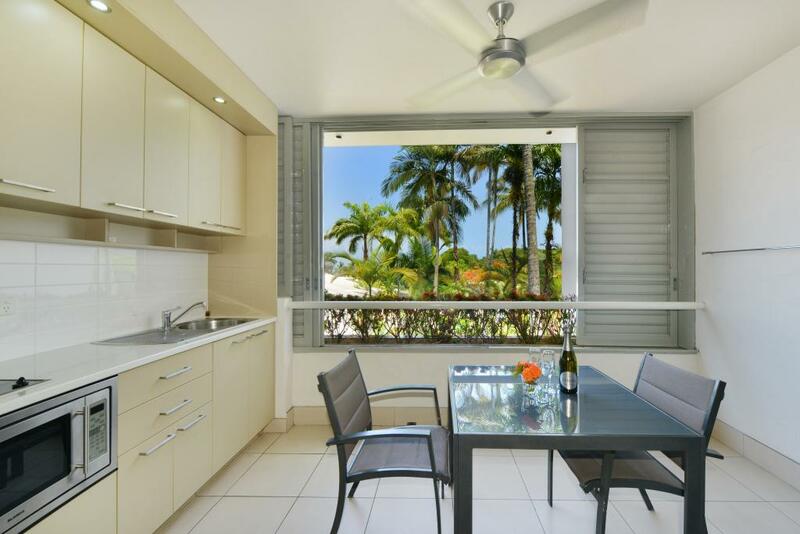 Tropical Studio Apartment: Tropical decor with alfresco kitchenette and outdoor setting on private balcony with village Views, lagoon pool or Dickinson Inlet. Bedding is 1 Queen Bed OR 2 Single Beds. Maximum room capacity is 3 Adults & Children. 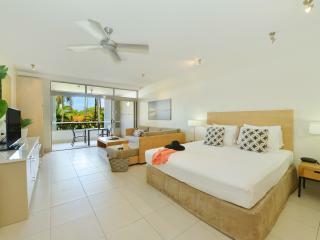 Club Studio Apartment: Modern and neutral decor with alfresco kitchenette and outdoor setting on private balcony with village views, lagoon pool or Dickinson Inlet. Bedding is 1 Queen Bed 2 Single Beds. Maximum room capacity is 3 Adults & Children. Tropical 1 Bedroom Apartment: Tropical decor, separate bedroom with ensuite bathroom, alfresco kitchenette and outdoor setting on private balcony with village views, Dickinson Inlet, or the water gardens. Bedding is 1 Queen Bed OR 2 Single Beds. Maximum room capacity is 4 Adults & Children. Club 1 Bedroom Apartment: Earthy, neutral toning with light airy feel. Separate bedroom with ensuite bathroom, alfresco kitchenette and outdoor setting on private balcony with village views, Dickinson Inlet or the water gardens. Bedding is 1 Queen Bed OR 2 Single Beds. Maximum room capacity is 4 Adults & Children. Club Family Apartment: Features a separate living area, kitchenette and a private balcony or terrace. Bedding is 2 Queen Beds OR 1 Queen Bed + 2 Single Beds. Maximum room capacity is 5 Adults & Children. From your accommodation at Club Tropical Resort, you can access an array of restaurants, bars, cafes and shopping facilities that are just a short walk from the resort.